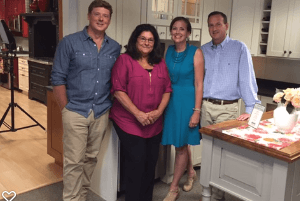 During the fall 2017 season, “A House for the Next Generation,” viewers follow the This Old House team as they transform a beautiful Newton, MA family home to suit three generations. 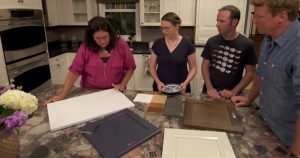 Kathy Cremone, our beloved and expert Carole Kitchen Design Manager brings her depth of kitchen design experience to the table. 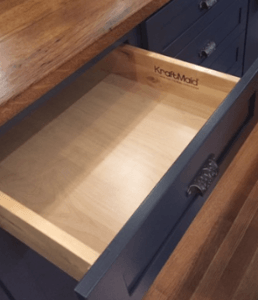 Kathy designed the Newton kitchen using KraftMaid’s Lyndale door style cabinetry, with 42″ high wall cabinets, and incorporating some distinctive elements such as a cool fireback and a farmer’s sink, and while part of the kitchen was designed in dove white, the island brings in a pop of color in midnight blue. The result will be a dramatic difference from where the kitchen journey began.